Tiny Jade taking an innocent nap. As always, I am a deep and reflective human being. I OFTEN look back at my life and wonder what lessons I was supposed to learn in various situations. I truly hope that I have learned what I was supposed to, along my path. I know I am not perfect, but WHO AM I? I am a writer, a poet, a lover, a friend who will drop everything to be there if you really need me, someone who stands up and fights against social injustice, I lose sleep over the suffering of others, I allow myself to feel things so deeply that I will openly weep when I just sense someone else’s pain.I am the rescuer of dogs and kittens in need. 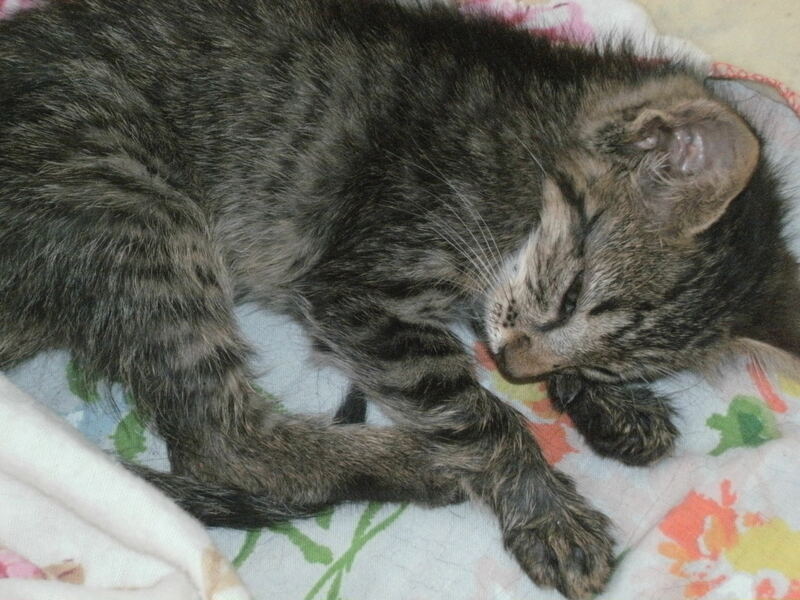 The photo above is the kitten I rescued just this week from a trap meant for wild animals. She’s just a few weeks old. I need a kitten like I need a hole in my head, but I am still warming formula for her and feeding her, holding her and taking care of her needs. It’s called compassion. At first I called her squeak, because meows sounded like squeaks coming from her tiny body. She is now opening her eyes wide and looking at me with trust. They are beautiful and green and I’ve always considered myself jaded. I’ve decided to call her Jade. When I love, I love deeply and with everything that I have to give. I fall in love too fast and I am really working on that….but I think my view of love is different than most people’s. Having lost SO many people that I loved and cared for to early death, I just feel that if you feel something strong for someone then you should show it and tell them often….because tomorrow sometimes really never comes. I wear my heart on my sleeve and I am not ashamed of that. I bristle when people tell me not to wear my heart on my sleeve. I’d rather fully immerse myself in all the feelings life has to offer than to not feel anything. I’d much rather feel pain than to be numb. I’ve been numb before and I fought hard to feel again. I am respectful of everyone until you give me a reason not to. I was once someone’s daughter. I am a sister who is not appreciated and I am a human being that is wounded over this fact. I am basically an animal that understands fight or flight – and I have done both at different times in my life. I have a lot of physical scars, but the emotional ones hurt the most. Even in a crowded room I get lonely, I often talk too much, but sometimes I say nothing at all. I can be laughing on the outside and crying on the inside at the same time. I tend to always cheer for the under dogs. I think that children are treasures, though I have none of my own. Being who I am or pretending to be something I wasn’t was the biggest choice in my life I ever made. I did not choose to be gay. I have come to realize that there is something about my personality that attracts people to me and I take this as a very serious responsibility. People talk to me and tell me that I make them feel at ease. People tell me all the time that they can trust me and feel safe with me. I truly try to be careful with people’s feelings and I don’t ever set out to hurt someone, but I’ve come to learn that sometimes you hurt people, even when you don’t mean to. I feel extreme responsibility for how my life affects the lives of others. I often can tell what someone is thinking or feeling and generally know what they aren’t telling me, as well. I’ve worked hard to learn how our lives are interconnected. I understand karma and the cycle of life. I don’t fear death anymore. I used to suffocate in that fear. I would lay in bed and be obsessed with death and be afraid. When both my parents died at the age of 58, I was quite sure that I’d die then too. It took YEARS to get beyond that fear. I often “think” too much. My mind never shuts off. I write things that sometimes make no sense, just to get the jumbled pile of thoughts out of my brain. I often know myself better afterwards. I wish more people would write. I think the world would be a better place if people could get to the core of who they are, or at least make the effort. It worries me that so many people have no interest in real growth. Spiritual growth is the only thing that is going to save us all and by that, I don’t mean Christian spirituality…simply an understanding of self and our connection to the world around us. I like to be called ‘sir’ and it makes me chuckle to myself when the cashier realizes their mistake and then tries to apologize. I’ve also observed that when men realize the mistake that they pretend it didn’t happen and never apologize. They also never look me in the eye again. Women ALWAYS notice when I SPEAK and then they always apologize. I find this to be an interesting social experiment. Why do men not apologize? Do they GET that I LIKE the sir thing? Are they just incapable of apologizing? Are they embarrassed and uncomfortable? I’m guessing the latter. I realize that I still have a LOT to learn and I hope that I will continue to do so until the day I drop dead. I have a natural curiousity about life, people and the world around me. Life is about evolving, changing, learning and growing. If you don’t do that, and allow yourself to dream, then you just aren’t experiencing life! Today I challenge each and every person who reads this to do ONE thing that you normally wouldn’t do. Practice forgiveness and compassion in your life. Step outside your box, try something new. Rescue a dog, puppy, cat or kitten. Speak to an elderly person. Say something you wouldn’t normally say to someone or take the time to write how you honestly feel about something. Let someone know that you love them truly and deeply, for life is short. Don’t wait for the time to be “right” or for your story to be “perfect”. Tell it while you can. So many need to hear it, even if they don’t know that yet.